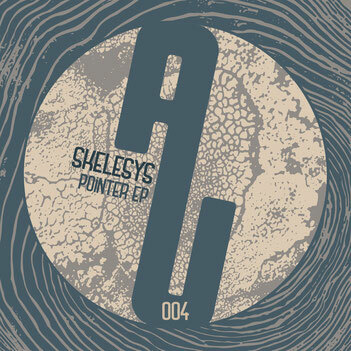 [AUM004] Skelesys - Pointer EP (incl. Marc Faenger Remix) - as-usuals Webseite! Argentinian wonderboy SKELESYS is finally ready to bring us a flush of joy and sonic eargasm for release No. 004. Already known for releases on Ninefont Music or Creepy Fingers, we are glad to have him on board for our next release. The multi-talented guy recently moved to Berlin and soaks up inspirations from diverse things and moments, rather he’s not afraid of versatile experimenting and fetching something from the deep void between the senseless and the rhythm. Exactly this is what we get on two remarkable original tracks plus one remix by MARC FAENGER. With the "POINTER EP", Skelesys digged deep in his tons of handcrafted loop stuff up his sleeve, as he usually performs only live. So the title track "Pointer" is just one of these outstanding tunes with a hint for prancing and dancing. Induced by a round mellow bass, the low frequencies perfuse for a massage like a moving sub-driven floor roller. Wired on subtle rhythms and a steady groove, slightly blurred elements copulating with mysterious bell sounds. Slick and tough snares, planted to be haunting smartly to a point, when it gets a massive waving ride. We are on! Predestinated for remixing "Pointer" is definitely Marc Faenger. Moreover he can add now our label next to references like Minus, Trapez, Little Helpers, Bla Bla Music and Cellaa Music. Marc’s remix seems at a first impression inspired by the time when he toured alongside Richie Hawtin and his crew around the globe. Odd-flowing sounds on meshing rhythms at the start imparting the idea of an intro tune for busy floor times. Unusual, but perfectly chosen, vocal phrases are coming along, which have been only spiced for the remix - creative thinking by approaching this project from a reversed point of view. Greatly defined break-ups and drops are kickn’ it into a piece of art, cultivated by a fresh and warm synth-sequence, that keeps the day longer and fills up the power. The geniously built arrangement with a long straight-edge end is just another feature of Marc’s flawless skills. Nonetheless, the stellar second original track "Estellar" is a powerful cosmic drive with grainy wings. Since ever flying was a human’s dream, but certainly herefor Skelesys takes off and gives us something from deep inside his mindgames. Interlaced rhythmic patterns with swooping riddles on a squeezed but pushing bass will guide the spaceship to the center of the dancefloor. The clever coup of putting greatly splitted synth cuts will lead this into a disinhibited state. Sweaty bodies ensured!